Last week I had a big house party for my friends who were with me during the Egyptian Revolution in Giza (read my experience here). We have gotten together three times this year and are already making plans for next year. The morning everyone said goodbye we did a commemorative Tarot reading. During the Revolution, we were not allowed to leave the hotel so we watched the Army in the streets, the stars above the Pyramids and read Tarot. 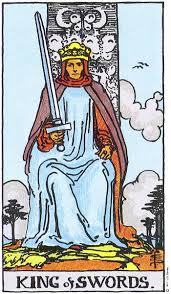 We each pulled two cards and my first card was King of Swords. Self-Expression is the key of this card. The King says “this is how it’s going to be” then he brings down the sword. He is the authority of his worldly kingdom. With his sword tilted to the side, he is ready for action in the world and he is the Emperor in everyday life. He doesn’t just bring down his sword on a whim but uses is it wisely when he needs to. The King balances the material world with the spiritual world and he takes responsibility for holding the balance, ruling what is rightfully his. Ok, big lessons for me. It is against my nature to be forceful and authoritarian. I want to make everyone happy and spend time with unicorns and glittery fairies, but I have a mini-kingdom to rule so I have to take on the role of the Knight of Swords to protect my domain and rule as I see fit. I need to say “this is how it is” and mean it. But that doesn’t mean I make everyone do my bidding rather that I don’t roll over and take it when my toes are being stepped on. I need my King by my side showing me how to keep my boundaries for myself and my kingdom. He will occasionally be disappointed with me as I try to unlearn my old habits, but with his help I will succeed most of the time. Maybe if I put glitter on the blade and with some rhinestones on the handle people will be too blinded by the sight to make me use it. This entry was posted in Egypt, Tarot, Uncategorized by theperpetualpilgrim. Bookmark the permalink. Very true and beautifully expressed, as usual.